Generating a receipt or an invoice to collect funds from your clients or customers is not difficult anymore. There are some really handy online receipt generators available that can help you to make a fancy or a completely simple receipt by just doing a few clicks. I am going to share 5 of them with you in today’s article. Among these 5 we have some very easy to use online invoice makers as well as online receipt making tools that can generate any type of receipt for you within minutes. Just follow the instruction given for each tool and you will be able to generate a handsome receipt or invoice without the need to bother your account’s department. Now let’s take a look at some of the best invoice generator websites. Invoice-generator.com is a free platform that allows you to generate cool looking free invoices easily. You are allowed to add a logo, the invoice issuer name, the name of the entity to whom the invoice will be sent. There’s also an additional field where you can add a small description each product or service as well as the amount and per unit price. The best part is that it also allows you to add the amount to the invoice which has been already paid as well as govt. taxes that should be added to the total amount. Additionally, you can also add a special note and terms for the invoice. 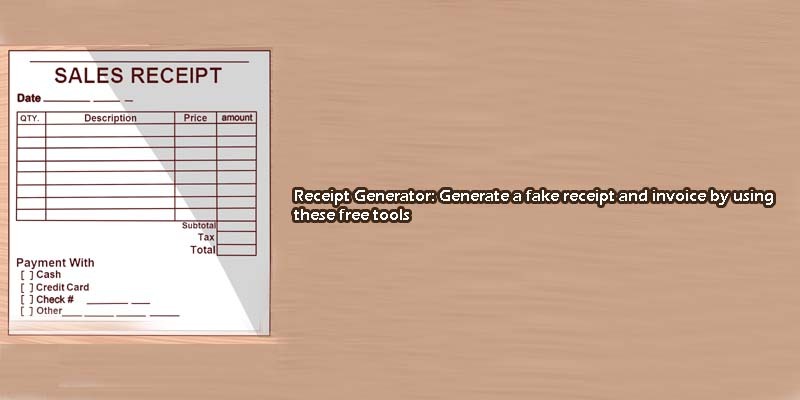 If you want to generate a fake receipt, then fakereceipt.us is the right choice. You can add a slogan on the seller, item prices, postal address as well as cashier and customer name. Moreover, you can also add payment methods and tax rates to make your receipt fancier. Freeinvoicemaker.com allows you to create free invoices as well as creating receipts. You can add a logo, product description, customer and client details and receipt date and receipt number. Moreover, you can also add terms to your receipt. You may also add an additional note to the invoice by using this free invoice generator. Customreceipt.com is another option for people who want to generate a fake receipt from the internet. It allows you to make a basic invoice which can have 3 top lines at the top of your receipt. You may add a company’s name, address or phone number in those three lines. Then you can also add up to 4 items along with their prices on the receipt. You can also add additional 3 lines at the bottom of the receipt. Generally, these bottom three lines are used to add some special notes or guidelines for customers. By using customreceipt.com you can also generate the total cost of your items or stop doing it from it by choosing “Don’t show a total” option from the drop-down. This is possibly the best option for anyone to generate a fake receipt from your mobile phone. Just grab your Android phone, install this app and you are ready to make your first receipt. Receiptish is a smart mobile app which allows you to generate POS style receipts from your phone easily. The best thing is that it can even work without an internet connection. It can also be used for generating an invoice. For me, it is the easiest way to generate a new invoice or receipt since it allows to generate an invoice or receipt from your mobile phone within few clicks. These are my best 5 tools to generate a fake invoice or receipt, share your favorite tools with me in the comment section. That was a knowledgeable read! Thanks for it!